It has a body with arms, legs, hands, eyes and a brain. At this moment it is moving around on the Red Planet. It is not a Martian,we know that they do not exist, and neither is it a strange form of life. In truth, it aims to find primitive life forms. We are talking about the Mars Science Laboratory, also known as the Curiosity rover. It is a small robot, in technical terms a robotic rover, the latest of a series of robots that have been sent to Mars with the precise objective of answering some queries, the most important being: Is there or has there ever been life on Mars? Let’s proceed step by step and get to know more about the Curiosity rover. The Mars Science Laboratory is a rover of the U.S. Space Agency (NASA). It was launched from Cape Canaveral on 26 November 2011. After a journey in space that lasted over eight months, on 6 August 2012 Curiosity entered the Martian atmosphere and with a skillful manoeuvre, worthy of the best astronauts, successfully landed in the Gale Crater where it will operate for at least one Mars year (approximately two Earth years). The aim of the mission is to investigate whether there are favourable conditions for microbial life and also whether Mars was ever capable of supporting life. 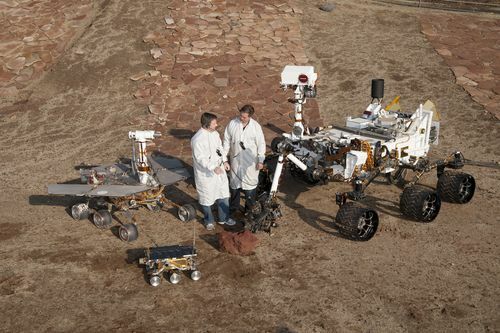 Curiosity is a real giant respect to other exploration rovers. About the size of a small SUV, it is 3 metres long and weighs 900 kg (of which 80 kg of scientific instruments). It is twice as long and five times as heavy as the two famous twin rovers, Spirit and Opportunity, belonging to NASA’s Mars Exploration Rover Mission which arrived on Mars in 2004. Just like a man, Curiosity has a body and special ‘organs’. The body, called Warm Electronics Box (WEB), similar to a resistant car body, protects the computer and the entire electronic system (the equivalent of the rover’s brains and heart). The body protects the ‘vital organs’ and controls ‘body’ temperature. You need brains to survive on Mars and Curiosity, it has to be said, is super intelligent. Unlike both humans and animals, its brains (a computer) are situated inside its ‘chest’, in a module called Rover Compute Element (RCE). Its brains/computer contains a special memory that can tolerate the radiations coming from space and that does not cancel data when the rover is put off at night. The nervous system, which in humans is in charge of the elaboration of bioelectric signals, in the rover is represented by an interface called a ‘bus‘ that exchanges data with the science instruments and sensors and coordinates communications with Earth. Moreover, the brains register signs of the rover’s health, its temperature and other vital parameters. Curiosity has particular legs, represented by six wheels, each with its own motor, that allow it to carry out precise movements along three axes also thanks to a particular system that keeps the body in balance, and to an Inertial Measurement Unit (IMU). This unit is used in navigation to ensure safe traverses and to estimate the degree of tilt of the surface. Moreover, the rover is able to avoid obstacles autonomously and to change its speed depending on the conditions of the terrain and the visibility. It can travel at a speed of up to 90 metres per hour using automatic navigation. During its two-year mission, it will travel for about 6 kilometres. How will scientists on Earth be able to study the terrain on Mars? Simple, they will see through Curiosity’s eyes. Actually, they will have seventeen eyes available, represented by cameras, each with a specific function; some are used for navigation, others for science investigation. The rover has four pairs of cameras (Hazcams) mounted on the front and rear. They use visible light to capture three-dimensional images of the terrain as far as 3 metres away. They protect the rover from getting lost or inadvertently crashing into unexpected obstacles. Two pairs of cameras (Navcams) are mounted on the mast (the rover’s ‘neck and head’). The navigation camera unit has a pair of cameras that guarantee stereoscopic vision, each with a 45 degree field of view, and allow scientists and engineers on Earth to plan the navigation. These cameras work in collaboration with the Hazcams in order to avoid dangers, providing a complementary view of the terrain. Curiosity does not just observe. Like a real scientist, it collects samples of the soil and carries out a chemical and physical analysis of the terrain. In fact, it even has a hand, a turret-shaped structure, at the end of its arm, that carries a drill, a brush, which is required to remove the rock dust produced by a powerful laser that is able to pulverise rock from up to 7 metres away, and a camera for close-up pictures. Moreover, the rover has a spectrometer capable of analysing the chemical composition of rocks and of the minerals altered by water and to check for carbon-based compounds, the organic substances that represent the building blocks of life. In order to carry out all its experiments and move around on Mars, a lot of energy is needed. How is Curiosity powered? All the energy required for two years of work on the Red Planet is supplied by a radioisotope thermoelectric generator (RTG), just like the ones utilised by Curiosity’s predecessors, Viking 1 and Viking 2, back in 1976. Do not look for solar panels on its body, because Curiosity does not use solar power, it is a rover powered by nuclear energy. In short, the RTG converts the heat (thermal energy) released by the radioactive decay of plutonium-238 into electric energy . Moreover, excess heat is used to maintain optimal operating temperatures for the electronic instruments and systems. An interesting fact: Curiosity is carrying a small part of Italy. In fact, on board there is a small chip containing Leonardo Da Vinci’s self-portrait and the Flight Code, a homage to the great scientist who was the first to study and describe the flight of birds. Let’s get back to the goal of the mission: to look for traces of past or current life on Mars. When the Viking probes sent the first images of Martian soil in 1976, they revealed that unfortunately Mars did not have an advanced civilisation capable of building artificial canals to collect water or for irrigation. In fact, the first images showed a desert-like landscape very similar to Earth’s tundra. Then why have there been scores of other missions since 1976? Why is the study of Mars so important? 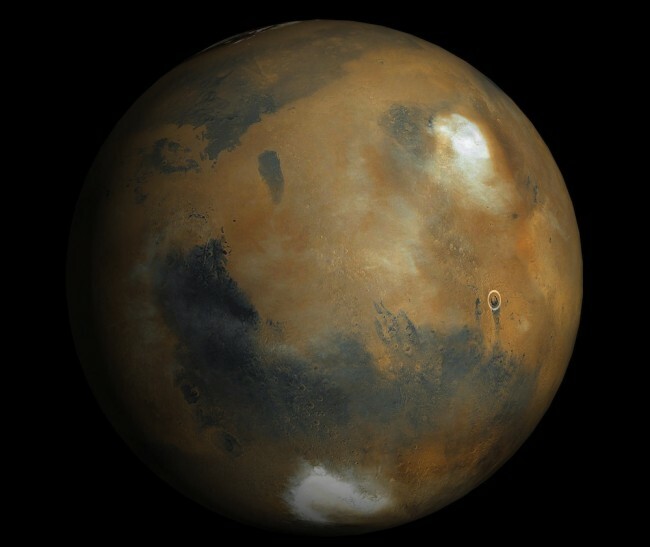 Mars is the only planet whose environmental conditions are not too different from those on Earth. 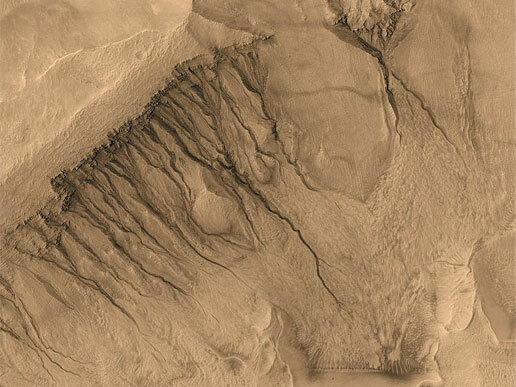 Observing the images sent by the probes in orbit around Mars, traces of water ice can be detected at the poles and the entire surface is criss-crossed by canals. Hence, in the past there must have been sources of water, which are the most likely places to look for elementary forms of life. Curiosity’s mission is to analyse the composition of Martian soil and to verify, in particular, the presence/absence of carbon, the key element of organic matter. For this reason the landing site was chosen very carefully. 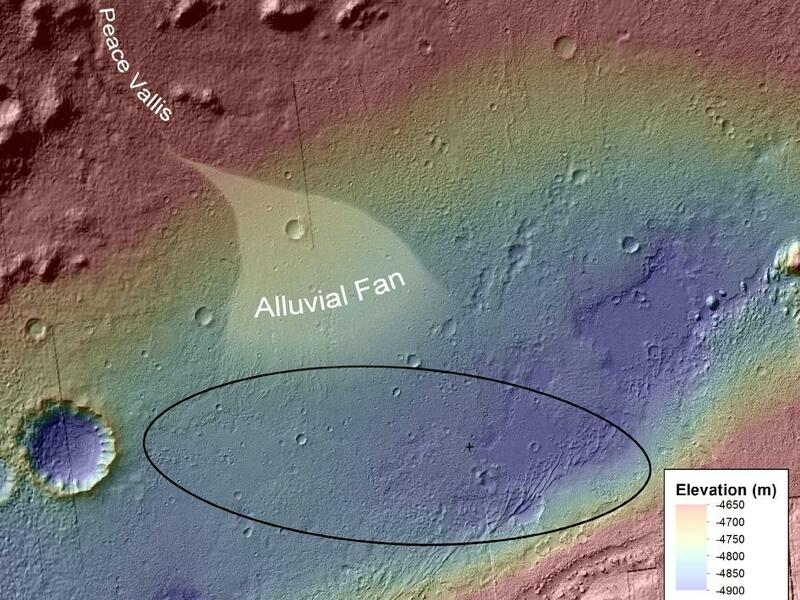 In fact, Curiosity landed at the foot of a mountain inside Gale Crater. The layers of this mountain contain minerals that form in the presence of water and it is therefore possible that they might preserve some organic compounds. Curiosity’s landing site is on an alluvial fan at the bottom of the crater, a fan-shaped mass of sediments usually generated by a water course at the mouth of a valley. 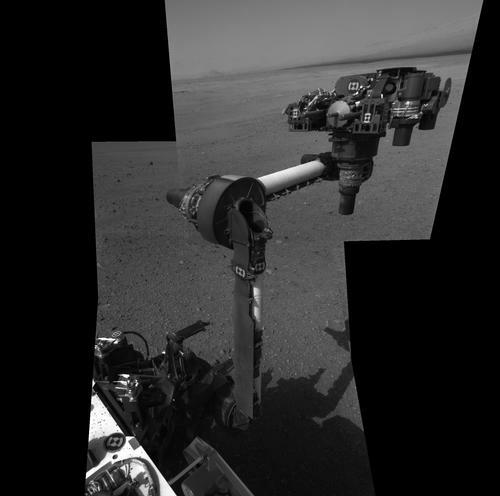 The Curiosity rover has obtained good results from the very beginning. In fact, the first rock analysed, named Jake Matijevic, has an unusual shape and composition, different from those identified by the rovers Spirit e Opportunity. Its chemical composition resembles that of a type of rock that is often found in volcanic regions on Earth. But it is still early to say that the process behind its formation is the same as the one that occurred on Earth. However, should it be confirmed, it would be an important discovery, because on Earth these rocks are formed through the solidification of relatively water-rich magmas at elevated pressure. In other words, since its first steps on the Red Planet, Curiosity has made significant discoveries. We just have to be patient and wait for new results. 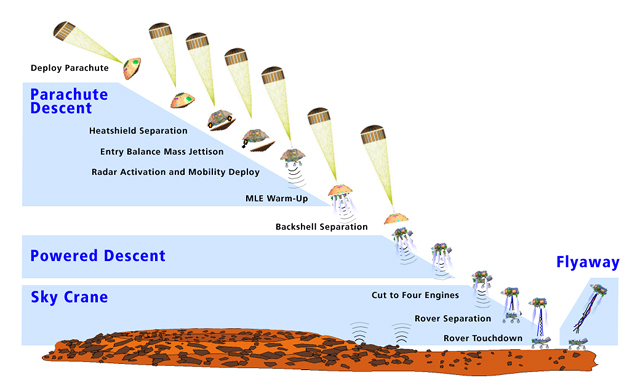 After a journey of eight months and a half in space, protected by the largest capsule ever to have entered the atmosphere of a planet, Curiosity faced the difficult landing phase. Just 420 seconds, seven terrifying minutes, were required to slow down from the speed of 21,000 kilometres/hour at which Curiosity was travelling to a standstill, in order to gently land in the Gale Crater, near the Martian Equator. During the so-called ‘seven minutes of terror’, seven minutes of high-risk manoeuvring, the probe had to land autonomously since a radio signal takes about 14 minutes to go and come from Mars, 250 million kilometres away from Earth. Three orbiting probes, among which the European Mars Express, were watching over Curiosity, positioned in such a way as to pick up signals in those seven minutes when the rover was on its own. Let us take a quick look at the various phases of the event. The rover begins its descent at a very high speed, 21,000 kph. 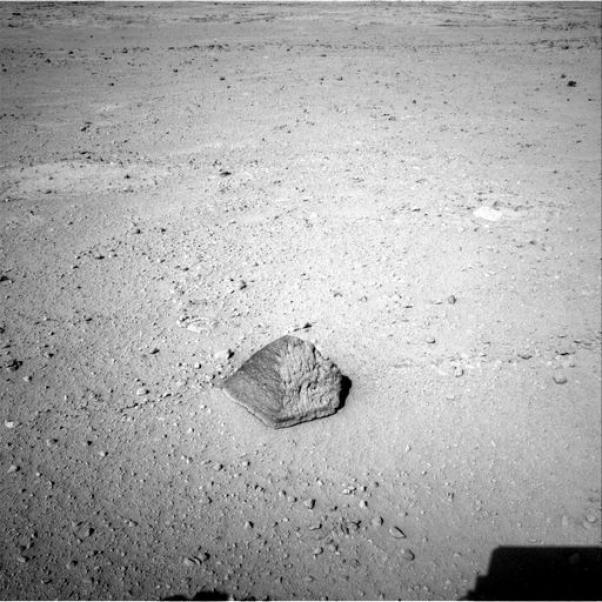 The Curiosity rover is protected by an encapsulating aeroshell. Its speed is reduced by atmospheric friction. The heat shield protects it from burning. Its speed now is 2450 kilometres per hour (Mach 2), i.e. twice the speed of sound – too fast for landing. 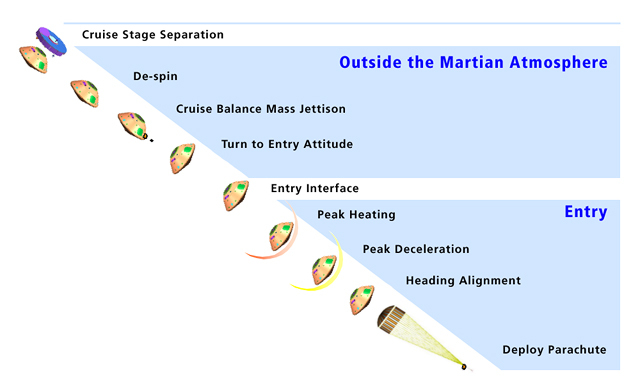 The Martian atmosphere is not dense enough to slow the spacecraft’s descent. Hence a parachute capable of surviving supersonic speeds is deployed. After a few seconds, the bottom part of the aeroshell is released and a radar is activated to measure the altitude in real time. At about 10 kilometres from the ground, the upper part of the spacecraft, still attached to the parachute, separates from the rover, letting it fall freely. Four pairs of rocket thrusters are fired. These produce about 500 N of thrust per pair. This allows the rover to steer towards the landing site. Having been slowed down by the parachute, the rover is now at an altitude of 1.8 kilometres and is travelling at a speed of 100 metres per second. At this point the rover separates from the descent stage. Only a platform mounted above the rover is still attached, which has eight rocket engines capable of further slowing its descent. Curiosity prepares itself for touchdown; like aeroplanes it lowers its wheels for landing. There is a ‘soft’ landing using the Sky Crane system for the first time. The Sky Crane is a sort of flying crane with three seven-metre-long bridles that unfurl, releasing the rover. Just a few moments are left to touchdown. All the tethers are severed using explosive bolts and the descent vehicle fires rockets in order to move away and crash at a safe distance from the rover’s landing site. Curiosity is finally on the surface of Mars. The mission can begin! This system that seems so complicated was necessary because Martian atmospheric density is such that the use of rocket engines would have been insufficient to slow down the rover’s speed and at high speeds the vehicle would have been unstable. Moreover, the thin Martian atmosphere also implies that braking using only a parachute and other aero-braking systems is inadequate. Lastly, since the Curiosity rover is much bigger than its predecessors, the use of airbags would have been insufficient to cushion the shock of landing and surely the result would have been a crash. Astrophysicist and science populariser, Ms Romaniello is responsible for formation and development and the installation of museum exhibits for the Turin Planetarium.